Base camp for our trip was the fabulous Borgo Torale set amongst the olives overlooking Lake Trasimeno. Check out their website for the history and more photos. Castiglione occupies a fine position jutting out on a promintory into the Lago Trasimeno. Great wild boar ham from the local deli! We took the boat from Passignano to the Isola Maggiore on Lago Trasimeno. We arrived at about quarter past twelve; unfortunately St Francis had left by 1211! 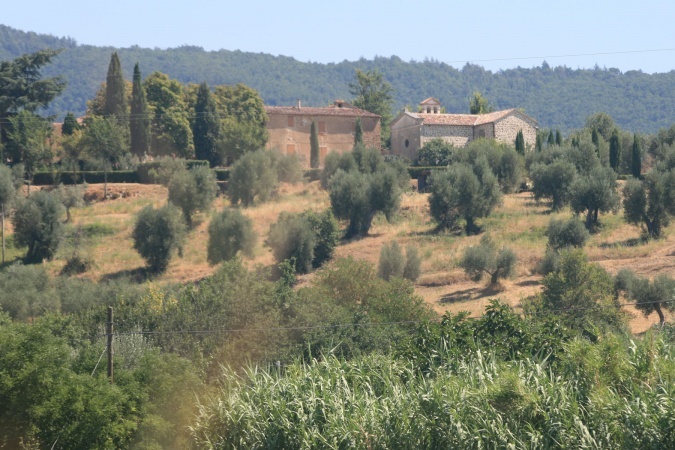 Ash and family were staying about 30 miles up the road from us at Norman's Umbrian bolthole, Casa Rovigliano near Città di Castello. Very nice. Siena is a beautiful Tuscan city. We missed the Palio - the horserace around the fabulous Piazza del Campo - but the gelati still won first prize in our extensive tasting competition! Another beautiful Tuscan hilltop-town ... is there a hilltop in Tuscany or Umbria that isn't crowned by a beautiful town? At 165m, the Cascate delle Marmore near Terni are amongst the highest waterfalls in Europe. They were created by the Romans in 271 BC when they diverted the River Velino with the intention of draining marshlands to the south, without flooding Terni ... in our opinion, a missed opportunity! When we realised that the Cascate delle Marmore were more than half way to Rome, we decided on an unscheduled trip to the Forum. So much to see, so many photos to take! On our last full day, Laura and I abandoned the boys by the pool and headed south of lake Trasimino to the hill towns of Panicale and Paciano. The area is most famous for Hannibal's victory over the Romans in the Battle of Lake Trasimene in 217 BC. (I think Rome may have gone through on away goals in the second leg). With temperatures consistently in the mid-30s, the pool at Il Torale provided a welcome relief from the heat!